Hot foil stamping machines has an exclusive touch to brighten attractive and decorative features on Packs, Boxes, cartons, labels, greetings and wedding cards and other printing items. 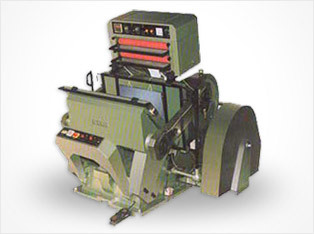 These hot foil stamping machinery is especially useful for manufacturers of cosmetics and liquor boxes. Three different strokes can be adjusted for printing three different blocks of different length. Arrangement of one foil jumping is there. Inside Chase 51 x 66 cm., 20 x 26 In. 56 x 82 cm., 22 x 32 cm. 64 x 94, 25 x 37 in. Platen Size 56 x 71 cm., 23 x 29 In. 61 x 86 cm., 24 x 34 In. 71 x 101 cm., 28 x 40 In. H. P. Reqd 3 H. P. 3 H. P. 5 H. P.
74 x 66 x 58 In. 198 x 180 x 152 cm, 78 x 71 x 60 In. © Copyright 2014 Indo Europa Trading Co.